One day I was on Facebook and someone posted a picture of a gift that her mother had painted for her birthday. The tray was one of my designs so I was excited when I saw it. I always love when people paint my designs, but I really love when they take my design and personalize it. Here is the picture that I saw on Facebook. And here is my original design. On my project I had painted on a printout of a recipe that I had sized to the project. 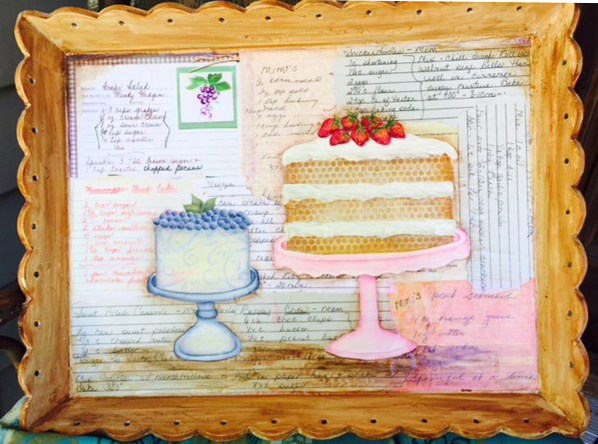 But if you notice on the original note Susie Whitfield, the artist had used original recipes from her family. I absolutely loved what she did, it was so much more personal than what I had designed. I asked Susie if I could blog about what she did and she graciously agreed. She made hers a keepsake, an heirloom, a family treasure! Susie had painted her piece on a tray. First she glued her family recipes to the background. And then she painted the design on top. This was a gift for her daughter for her 28th birthday. A daughter she had not seen in over ten years due to a lot of personal issues. She searched her heart for the right gift, asking God for guidance, knowing she was going to see her soon. She like most artists will attest to, speaks through her painting. Now what to paint? At HOOT she saw my pattern and the idea engulfed her. Her sister was with her and agreed to share her recipes. I’m late posting this but, for my birthday (along with several other perfect gifts) my mom made me this tray. It is made up of a collection of recipes from women on both sides of my family. Most of them are the original hand-writing of from grandmothers down to myself (from an elementary school recipe book ha). Such a special, thoughtful, and beautiful gift. Life can take some beautiful and unexpected turns and for that I am grateful. This is a picture of Heather and Susie with the tray. I love everything about this story. I loved the creativity of Susie and how she made her project personal. I love even more the story behind the piece and the healing power of art. Later that day Susie and Heather painted together. Thank you Susie and Heather for sharing your beautiful story. I hope you are blessed by this story, I know that I am. PS. The pattern is named “Everything Nice”. I picked the name because of the rhyme of what little girls are made of “sugar and spice and everything nice”. The story now makes the title even more perfect. The pattern is available on my web site and also from Cupboard Distributors. …speaking with Art, love the Art and the story….. Thanks for sharing this lovely story with everyone. Susie is one of my dearest friends and a most gifted decorative painter. However, she herself is the greatest gift as you can tell by the thoughtful nature of Heather’s tray and the love behind it. Hi Carol, you are blessed to have such a wonderful friend. I am thankful that she shared her story.